Cook a 500g pack De Cecco Gnocchi di Patate according to pack instructions. Remove and discard the skin of 2 x 220g packs Roast Chicken 2 Breast Fillets (or 450g cooked chicken or turkey), and cut into bite-size chunks. Heat 1-2 tsp olive oil in a pan and gently fry the chicken for 4-5 minutes, until thoroughly heated through. Drain the gnocchi thoroughly and return to the pan with the chicken. 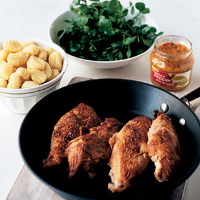 Stir in 190g jar Waitrose Roasted Pepper and Almond Pesto until evenly coated, then add 100g watercress, torn into small sprigs, and serve immediately.